and writer, she also was a photographic model and a stunning young woman, from photos of that time. 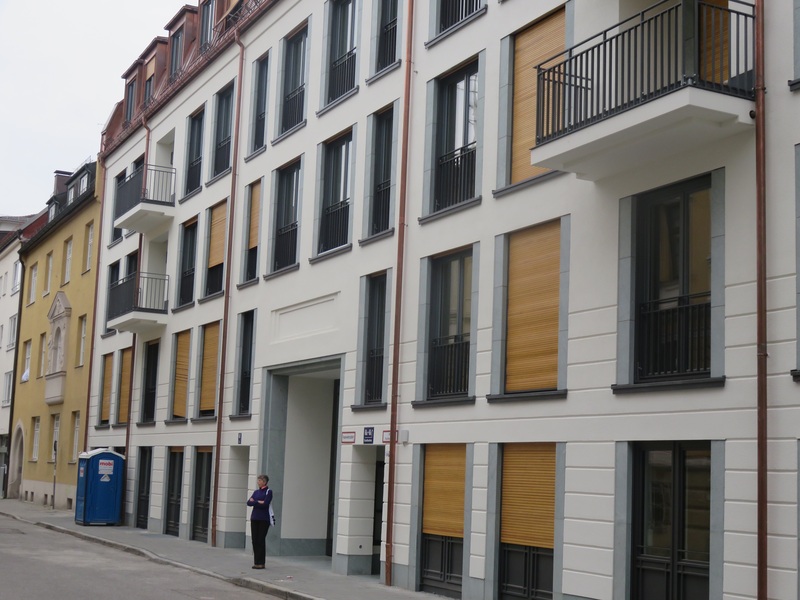 Next door to us, in the 1930’s, was a home for the Don Bosco Sisiters, an Italian Catholic order of nuns, who provided food and shelter during the bombing of Munich in 1944. Walking along the street now, there is still evidence of religious groups and a small church, within a courtyard. 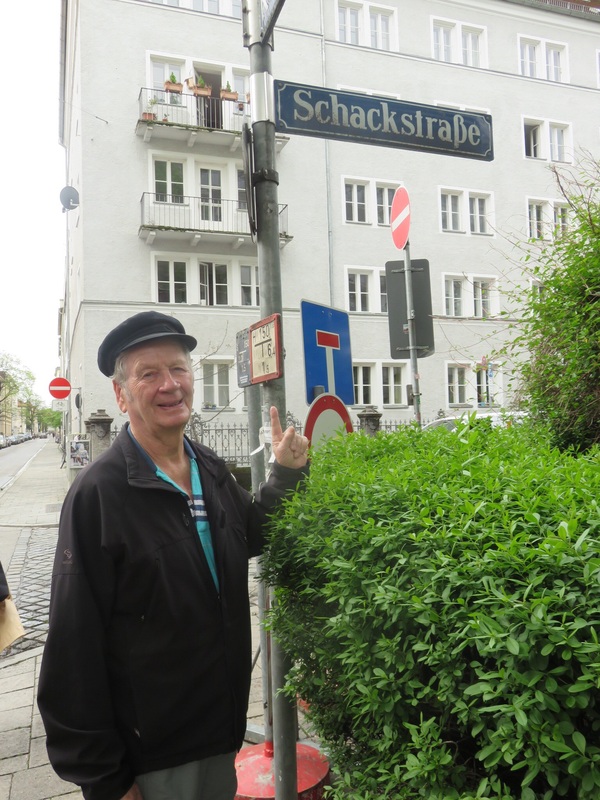 At the first cross street is Schackstrasse and across from the intersection is a ‘Tante Emma’, a corner store selling essential food and drink items. This Tante Emma is a large dour lady but she does very well supplying wine and beer to us! 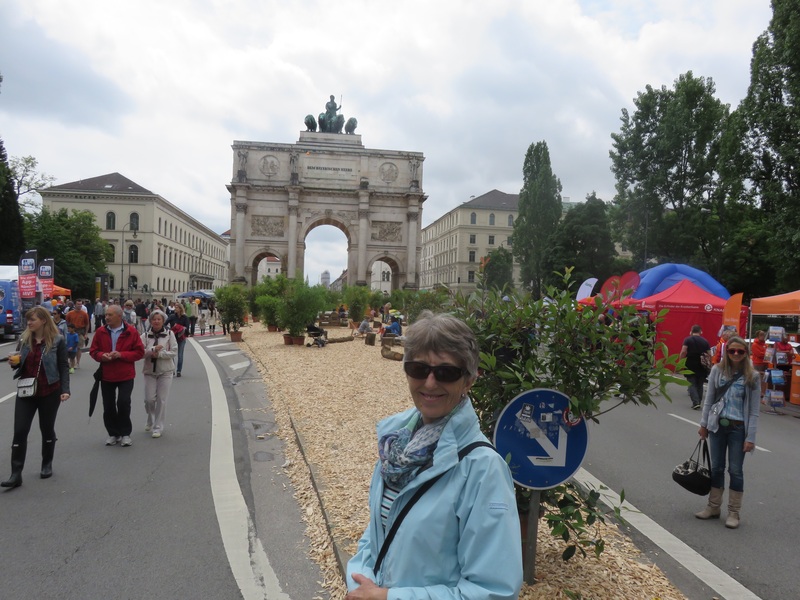 Leopoldstrasse and is filled with history. 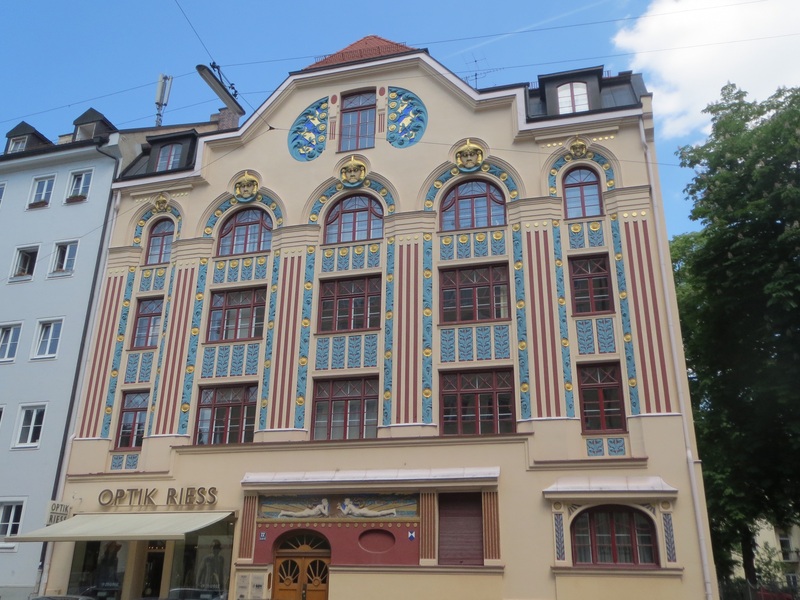 There is a route you can take by bicycle which traces the best of Jugendstil architecture. Dating back to the turn of the century, this ‘Young Style’ is reminiscent of Art Nouveau. The tall buildings, which stand with no gap between them provide wonderful facades for plaster and paint, with Greco-Roman and Eygptian themes. Dotted throughout these building are plaques indicating where famous artists, writers, actors and philosophers lived in the brief flowering of modern artistic life, from 1900-1918. 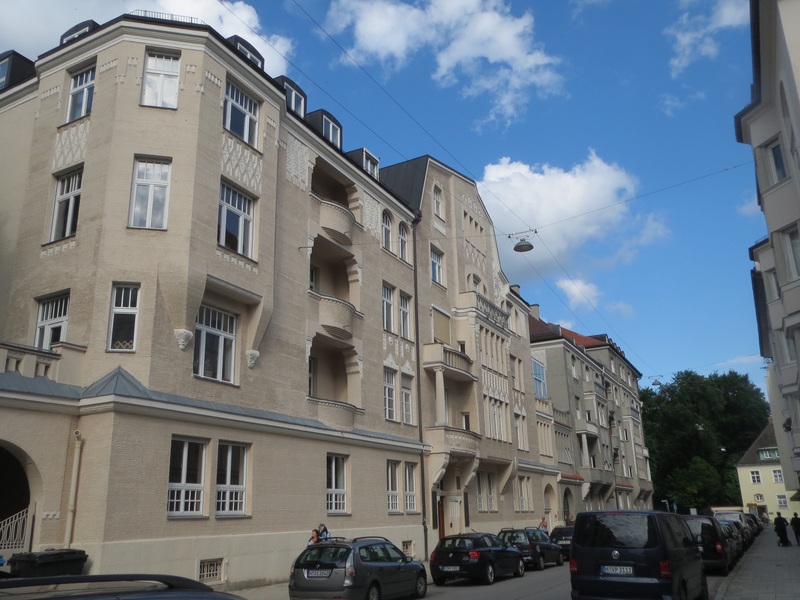 People such as the artists Paul Klee and Vassily Kandinsky, and the writer, Rainer-Maria Rilke all lived next to each other in Ainmillerstrasse. 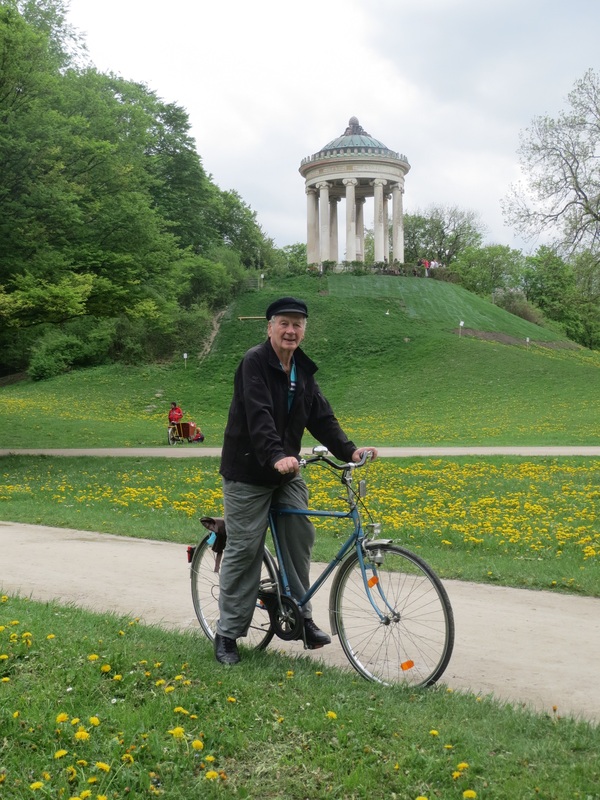 On our side of Leopoldstrasse just one block away is the Englischer Garten. This huge tract of greenfield – mooted to be one of the largest city parks in the world – was initially established in the 1700’s by an Anglo-American army officer, Benjamin Thompson, Graf von Rumford, who as War Minister, spent 11 years reorganising the Bavarian army in the late 1700’s. The marshy land around the river Isor was drained for a military garden to assist Bavarian troops to learn about growing food to support themselves during war. Alongside this the main Garden was designed in the manner of an 18th century English park and the two incorporated together in 1800. There is a memorial to Rumford recognising his role in establishing workhouses for the poor and promoting the idea that all should have access to food and shelter. 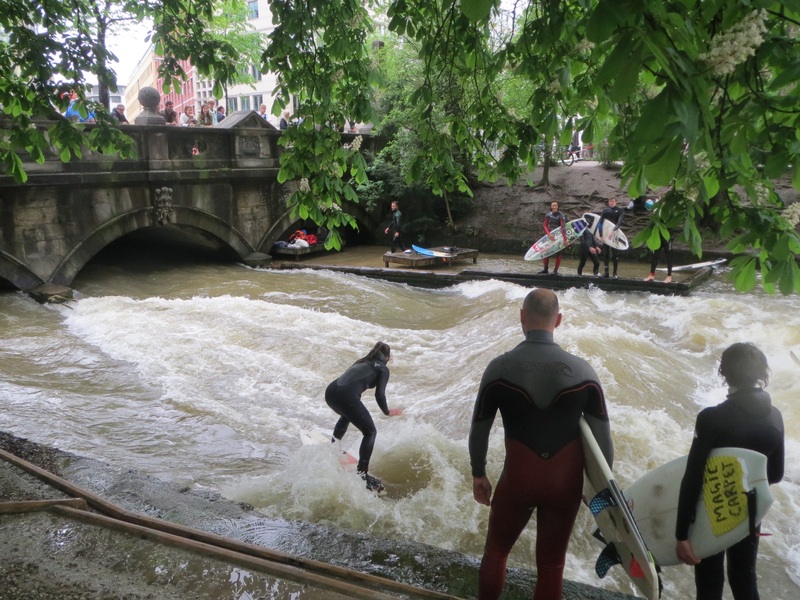 Quite close to the memorial is the famous surfing site on the Eisbach, where young men and women can be found cycling In their wetsuits, clutching their boards and very civilly waiting their turn on the artificially created weir in the river for a ‘surf’! Even Guy Sebastian had to have a go, as part of his promotional video for competing in Eurovision! Some are better than others. bandstand. 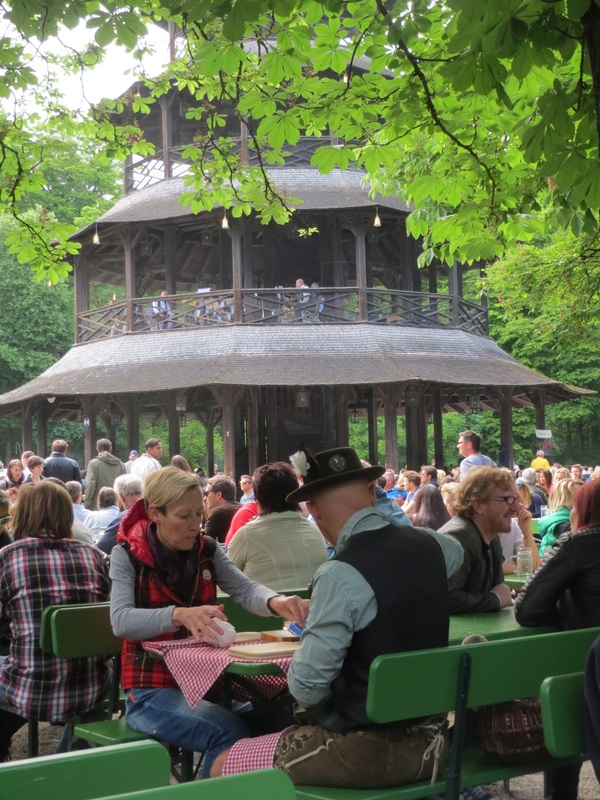 The beer garden below can seat 7000 patrons, who happily sit on long green benches drinking ‘halb’ or ‘mass’ (500ml or 1 litre) steins of beer accompanied by giant ‘Brezes’ ( bread pretzels). 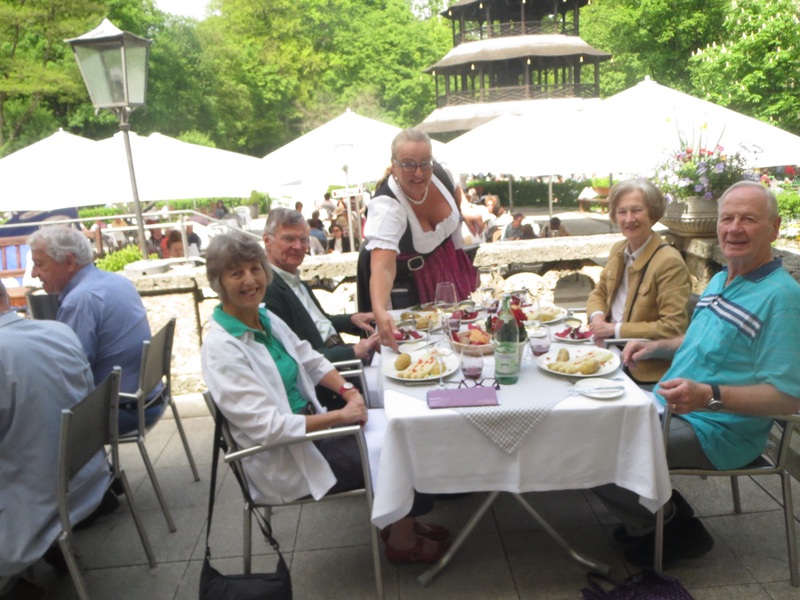 Together with Signe and Peter, we enjoyed a very civilised lunch at the nearby restaurant, served by a buxom wench in a dirndl. We have returned on numerous occasions to listen to the band, spot spunky men in lederhosen and drink beer in convivial company. We are now biking veterans.